Celia Diamond smiled as she and her family held hands in a procession behind the Torah at services Saturday at the Bristol Jewish Center. 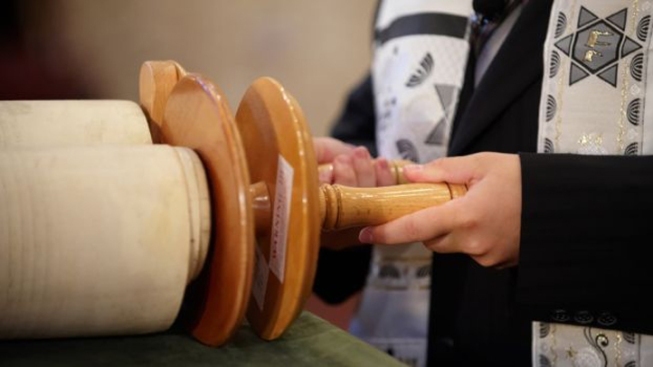 She had reason to be joyful because the ritual was part of a ceremony marking her bat mitzvah, through which, in the Jewish tradition, young women demonstrate that they have completed religious studies and are prepared to participate in worship services. Diamond's bat mitzvah was all the more meaningful because that benchmark was conferred on her just two months before her 93rd birthday. And it was a family affair, most notably because Diamond's daughter-in-law, Rabbi Judy Abrahamson, conducted the rites. Diamond's journey to the pulpit was a long and sinuous path because she grew up in Scotland at a time when such a benchmark, a bar mitzvah, was conferred on boys only. For girls, it was unheard of, she said in an interview before the service. "It was something we never even thought about,'' said the diminutive Highland Park, N.J., resident, whose youthful face belies the decades behind it. It was "my daughter-in-law the rabbi'' who convinced Diamond that a bat mitzvah was a fitting tribute to an extraordinary life. And it was through Rabbi Abrahamson that Diamond studied every day to learn the passages and other components of religious instruction leading up to her bat mitzvah. Abrahamson said that her encouragement stemmed from what she believed was her mother-in-law's wistful lamentations at similar occasions for her grandchildren. Diamond is a widow who also has a daughter, Iris Polotach, four grandchildren and one great-grandchild. Even today, the more conservative Scottish Jews are reluctant to accept women rabbis or bat mitzvah ceremonies, Abrahamson said. Bristol Jewish Center treasurer Alan Vogenberg recalled that Jewish tradition evolved slowly over the centuries. In ancient time, women were required to sit in balconies blocked with fencing and cut off from the men on the lower floor of a synagogue. Even when women were permitted to worship on the main floor, they were separated from the men by a wall. Some Orthodox Jews still adhere to those traditions, but men and women have equal places at the Bristol Jewish Center. Rabbi Abrahamson said her mother-in-law made the ritual transition over time. She grew up in Scotland but lived for a time in Israel, before moving to the United States in the 1970s. "She stays active, she keeps kosher, and loves Israel, she's always kept the Jewish traditions,'' Abrahamson, adding that even today, Diamond is involved in civic and charity organizations in Highland Park. Justine Seligman, Diamond's granddaughter, arrived from New York City to witness her grandmother's ceremony and celebration afterward. "It's so nice that she's doing this. I'm very proud of her that she's getting up in front of all those people to read,'' Seligman said, referring to the scripture passages that Diamond read before and after the Torah ceremony.